The Face of Your Home: Your Garage Door - Overhead Garage Door, Inc.
As a homeowner, you have an extensive list of things you have to do on a monthly, weekly, and daily basis. If you’re not careful, it can get overwhelming and become quite easy to forget about certain aspects of your property. Garage doors, for instance, might not come to mind as the single most important feature of a home — but they shouldn’t be neglected, either. Your garage door is the face of your entire home and needs to reflect the rest of your property in a positive and visually appealing manner. You could have the nicest home with the cleanest windows and beautiful siding; but if your garage door looks worn-down and feeble, it’s going to drastically devalue your entire property. If your garage door looks great, the rest of your home will as well! How can I improve my garage door’s look? First, you have to get in contact with professional garage door contractors who specialize in garage door installation. There are plenty of DIY projects you can do around your home to boost its appearance and value — garage door installation is not one of them. Instead, reach out to professionals in the Chicago area and let them install a new and beautiful garage door! After you’ve hired trusted contractors, covered garage door opener installation costs, and your garage is securely installed, it’s time to focus on general maintenance. Luckily, you’re not going to have to do too much to keep your garage door looking great and functioning properly. But you can’t completely neglect it, either. Simply keep tabs on your garage door and inspect it each day so you can quickly address any issues. If everything is fine: great. If not, you should contact garage door repair professionals. Your garage is a very important part of your home. It protects vehicles and other belongings from the elements and can be a great workspace or storage space. Make sure you’re doing all you can to keep your garage door looking fantastic! 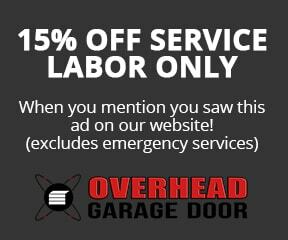 If you want to learn more about the importance of professional garage door installation and repair, contact Overhead Garage Door right away!